The amount of fats in meat and offal from Mangalitsa ranging from 8 g/100 g in pork leg to 80g/100g in lard, while cholesterol is found from 50 mg/100g to 130 mg/100g in the same products. Pig farming industry has a significant share in many regions of the world, with millions of pigs produced annually, providing thousands of jobs. In the past 50 years, this sector has produced remarkable changes that were not registered in any other species. For example, it suffices to mention that today there are pig populations with 50% less fat, than those from 50 years ago . Pork represents approximately 38% of animal protein consumed daily in the world. It is used in various forms around the globe, from the ordinary American hamburger to the Italian prosciuttos. Pork proteins are first quality protein that provides all essential amino acids . Pork lipids (representing on average about 7.5 g/100 g meat), are an important source of conjugated linoleic acid, which in light of recent studies (Department of Food Science and Technology at the University of Nebraska, USA ) can provide protection against some forms of cancer and heart disease because of its antioxidant properties . Pork is an excellent source of vitamins and trace elements, ensuring the needs between 10% (pantothenic acid) and 65% (for thiamine -vitamin B1) of the recommended daily dose. It is also an excellent source of pyridoxine, cyanocobalamin, biotin, niacin – soluble vitamins necessary for healthy metabolism . Minerals contained in pork provides between 9% (for iron) and 36% (for zinc) of the recommended daily dose, but also of phosphorus and magnesium . Consumers usually are looking for the exotic food (Argentine muscles, Norwegian salmon, Swiss cheese, etc.) or the daily source of zinc, important both for the functioning of the pancreas and to increase body immunity, being involved in the formation of antibodies, and they forget that they have a traditional source in the diet of many countries – pork . In general, consumers consider organic product as very healthy, of good quality and tasty. Meat and products from traditional breeds, like Mangalitsa pig, have a good image in the public and media. Consumed in moderate amounts, pork is a good source of energy, with beneficial effects on skin, eyes, nervous system, bones and mental performance. The content of essential antioxidants, pork provides better immunity to the organism . In the last decades, along with improved breeds of pigs, some European countries (Hungary, Switzerland, Austria, Germany, Spain and UK) and more recently the United States have revived primitive race Mangalitsa breeding, due to the special qualities of the products obtained from this breed . Because Mangalitsa is a fat type breed, the aim of our research was to know the fat, cholesterol and fatty acids content of meat obtained from this breed and from modern breeds respectively . Investigation was carried out on pigs of Mangalitsa breed (n=9, 536 age days), Large White (n=6, 273 age days), Landrace (n=8, 254 age days), Duroc (n = 7, 265 age days), Pietrain (n=6, 270 age days) and Large Black (n=5, 281 age days). Pigs were chosen from four farms in Hungary and three pig farms in Romania. In the abattoir for each hog were established the live weights, and hot carcass after slaughtering. For the chemical analysis the samples of muscle and fat tissues were taken from the pork leg, chop, neck, muscles and lard. In samples of muscle and fat tissues the fat and cholesterol were determined. Total lipids of samples were extracted by using chloroform methanol (2:1, v/v). An aliquot of total lipid extract was used. Then, the fatty acid methyl esters were analyzed by a gas chromatography. Oven temperature was at 200°C and carrier gas velocity was 25 cm/s. The injection port was at 250°C and the detector was maintained at 300°C. Results were expressed as percentages of the total fatty acid detected based on the total peak area. Most consumers want a healthy diet, so it is important to know the contents in fat and cholesterol for the consumed products. The amount of fats and cholesterol in meat and lard from Mangalitsa are presented in Table 1. Compared to the amount of fat found in various portions of meat, it is found that, except lard which have 80gfat/100g, is equal to an adult needs per day/individual, in other meat pieces, the amount of fat is small, with maximum 21g/100g in muscles. Although Mangalitsa is a breed for fat, cholesterol content of meat and even of lard is well below the recommended daily dose for an individual of 300mg/day. Lard is the richest in cholesterol, having a content of 130mg/100g. The smallest content of the test portions was found in the pork leg – 50 mg cholesterol/100g. Due to these qualities of Mangalitsa meat, lard and other products are becoming more and more known and sought after by the consumers . The fat is high-quality and gives the meat flavor. The fat in meat or fat is regarded as giving the palatability and “sweetness” of the meat. Mangalitsa fat content is 12-16% less saturated fatty acids and 8-10% more unsaturated fatty acids (like n-3 and n-6) than the modern pig breeds . Fatty acid composition of back fat samples from Red and Blonde Mangalitsa and five modern pure breeds were analysed. The same feeding strategy and fattening rations were fed to all of the animals (Figure 1). The highest ratio of saturated fatty acids was found in Duroc breed (42.95%) while Red Mangalitsa with 35.88% had the lowest ratio. Seenger (2011) , found a lower ratio for saturated fatty acids in Duroc of, 41.2% and 36.87% in Large White. However, in Swallowbellied Mangalitsa the ratio of 40.94% was much higher than in Red or Blonde Mangalitsa. 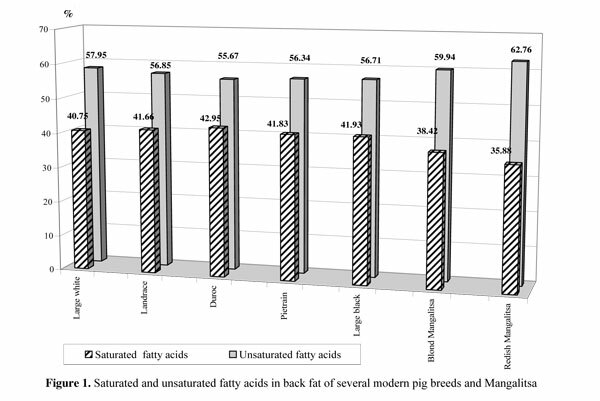 In a comprehensive study Szabó and Farkas (2006)  analyzed the fatty acid composition of back fat samples from 7 purebred (including Blonde and Red Mangalitsa) and 3 crossbred genotype. They found the lowest ratio of satturated fatty acid in Red Mangalitsa (36.99%) and the highest ratio in Duroc x Cornwall hybrid (44.65%). Among the pure breed Szabó and Farkas found the highest ratio for satturated fatty acid of 43.175 in Duroc breed. Analyzing the ratio of unsaturated fatty acids by breeds, it could be conclude that the values of Red Mangalitsa were the highest (62.76%). In Landrace, the ratio of unsaturated fatty acid was the lowest, with a value of 41.66%. A higher ratio of unsaturated fatty acids was found by Szabó and Farkas (2006)  in Red Mangalitsa (63.01%) and the lowest in a Duroc x Cornwall hybrid (55.35%). For pure Landrace breed they found a ratio much higher of 57.16%. It is well-known that the lower saturated fatty acid content and higher unsaturated fatty acid proportion is advantageous for human health . Quantity of fatty acids in fat obtained from Mangalitsa varieties are influenced by diet, because the consumption of green pasture mass, increases fatty acid content, especially omega 3 . It is therefore very important for producers and consumers to have access to reliable information and certification of products obtained. Diagram was created by using Microsoft Office 2003 Excel. By using a controlled diet, meat and fat from Mangalitsa have a special chemical composition, with monounsaturated fat in a much higher rate compared to other breeds of pigs. In accordance with the present trend, it is important to preserve healthy products derived from traditional breeds which suitable for an extensive production system. For improvement of production traits such as (precocity, prolificacy, and body weight) can be taking into account Mangalitsa crossing with other modern breeds such as, Large White, Duroc and Landrace. In future, additional researches are needed on muscle quality, as well as fat quality, sensory and nutritional properties of meat. Fatty acid profile of meat should be investigated in detail, with special emphasis on the influence of traditional feed (ie grazing, acorns, chestnuts) on the profile of fatty acids in meat and potential health benefits to consumers. Consumer preference for traditional meat products must also be able to determine market demand and thus increasing number of pigs. 1. Jamison, W., Who eats meat: factors effecting pork consumption in Europe and the United States. Genetic and Pork Quality, Proceedings 50th EAAP, Wageningen Publ., 2000, 100, pp. 111– 118. 2. Miller, R.K., Factors affecting the quality of raw meat. In: Meat processing – Improving quality. Kerry, J., Kerry, J. and Ledward, D., (eds). Woodhead Publishing Limited, Cambridge, England, 2002, pp. 27-57. 3. Wood, J.D., Richardson, R.I., Nute, G.R., Fisher, A.V., Campo, M.M., Kasapidou, E., Sheard, P.R., Enser, M., Effects of fatty acids on meat quality: a review. Meat Science, 2003, 66, 21-32. 4. Bernue´s, A., Olaizola, A., Corcoran, K., Labeling information demanded by European consumers and relationships with purchasing motives, quality and safety of meat. Meat Sci., 2003, 65, 1095–1106. 5. D’Souza, D.N., Warner, R.D., Leury, B.J., Dunshea, F.R., The influence of dietary magnesium supplement type and supplementation dose and duration, on pork quality and the incidence of PSE pork. Aust. J. Agric. Res., 2000, 51, 185– 189. 6. Grunert, K.G., Bredahl, L., Brunsb, K., Consumer perception of meat quality and implications for product development in the meat sector—a review. Meat Sci., 2004, 66 (2), 227– 259. 7. Singh, P.N., Sabate, J., Fraser, G.E., Does low meat consumption increase life expectancy in humans? Am. J. Clin. Nutr., 2003, 78 (3), 526S–532S. 8. Nilze´n, V., Babol, J., Dutta, P.C., Lundeheim, N., Enf7lt, A.C., Lundstrfm, K., Free range rearing of pigs with access to pasture grazing-effect on fatty acid composition and lipid oxidation products. Meat Sci., 2001, 58, 267– 275. 9. Holló, G.J., Seregi, K., Ender, K., Nürnberg, J., Wegner, J., Seeger, I., Holló, I., Repa Examination of meat quality and fatty acid composition of Mangalitsa. Acta Agraria Kaposvariensis, 2003, 7 (2), 19- 32. 10. Petrović, M., Radović, Č., Parunović, N., Mijatović, M., Radojković, D., Aleksić, S., Stanišić, N., Popovac, M., Quality traits of carcass sides and meat of Moravka and Mangalitsa pig breeds, Biotechnology in Animal Husbandry, 2010, 26 (1-2), p 21-27, ISSN 1450-9156 Publisher: Institute for Animal Husbandry, Belgrade-Zemun, UDC 636.4 DOI: 10.2298/BAH1002021P. 11. Seenger, Julianna Kótiné, The effect of slaughter weight and genotype on the fatty acid composition of intramuscular and subcutaneous fat in pigs, Theses of Ph.D. Dissertation, Szent István University, Gödöllő, Faculty of Agricultural and Environmental Sciences, 2007, pp. 1-22. 12. Szabo, P., Fatty acid composition of the tissues of Mangalica and other pig genotypes. Hungarian J. Anim. Prod., 2006, 55, 293-311. 13. Lugasi, A., Neszlényi, K., Hóvári, J., Lebovics, K., V., Hermán, A., Ács, T., Gunde, J., Bodó, I., Dietary manipulation of meat fatty acid composition in Hungarian Mangalica and an industrial genotype pig, Acta Alimentaria, Publisher Akadémiai Kiadó, ISSN 0139-3006 (Print), 1588-2535 (Online), 2006, Volume 35, Number 4/December, pp. 385-395, DOI 10.1556 /AAlim.35.2006.4.3. 14. Warnants, N., Van Oeckel, M.J., Boucque, Ch.V., Effect of incorporation of dietary polyunsaturated fatty acids in pork backfat on the quality of salami. Meat Science, 1998, 49, 435-445. 15. Michaud, D.S., Giovannucci, E., Willett, W.C., Colditz, G.A., Fuchs, C.S., Dietary meat, dairy products, fat, and cholesterol and pancreatic cancer risk in a prospective study. Am. J. Epidemiol., 2003, 157 (12), 1115– 1125.